This post may contain paid referral and/or affiliate links. If you chose to sign up or purchase through my links there are no additional costs to you. Thank you for your support. 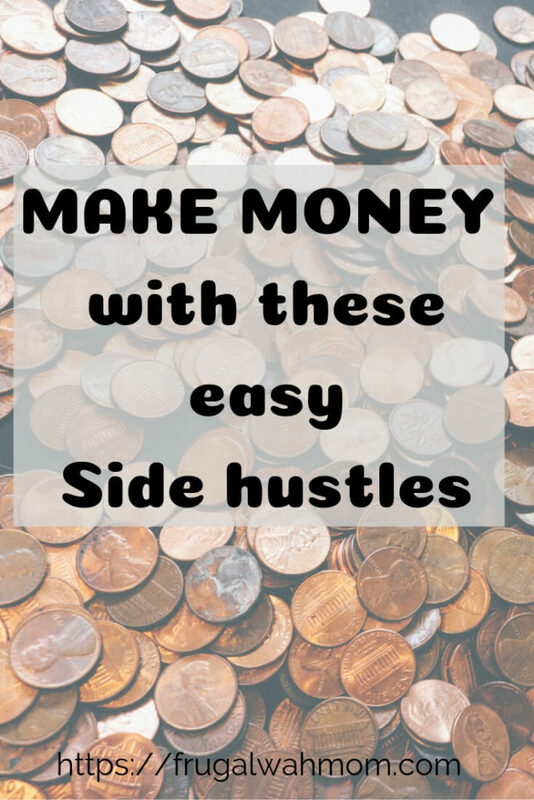 Side hustles are a great way to make some money. Sure sometimes it isn’t much, but not much here and not much there does add up. Check out my favorite side hustles and apps below. I have personally tried out every single app or website listed here. To save time and to get this information out to you I will give you a short description of each side hustle. However, I will be going back to each side hustle and doing a full post on each one in the future. Please keep in mind that many companies change things and I do my best to keep the information I provide up to date. If you notice something isn’t correct, please let me know and I will update it. 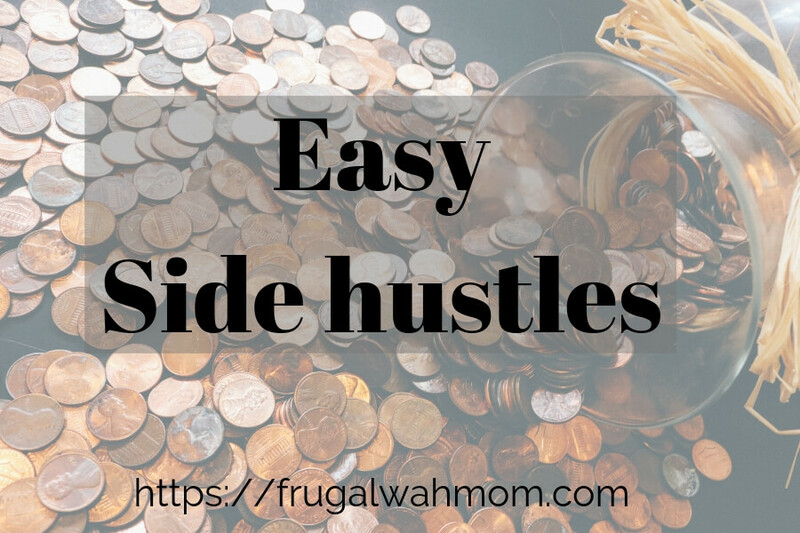 If you know of a hustle that I can share with my readers, please send me an email at traci@frugwalwahmom.com and I will check it out. Acorns is a round-up and investing app available on the web, iPhones, and Android. For example, you link your card and spend $9.50 and .50 will go to your Acorn account to be saved or invested. You can also use Acorns as your checking account. They also have a program where you can earn money back at certain partner stores to be used for investments. Sign up with my link and Acorns will start you off with $5. You can start your account by investing as little as $5. Transferring money out of your account to your bank or PayPal is simple with no minimum. Acorns has a great referral program where you can earn $5 for each referral and monthly bonuses as well. This month, November, you can get an additional $1,100 for referring 11 people. Ebates is a wonderful site that you can get money back on purchases made online. You create an account and search for the retailer you wish you shop at. There is a very good chance it will be listed on Ebates as they have so many stores they partner with. Click on the link for that store and shop as you normally would. Ebates tracks your order and if you make a qualifying purchase you get cash back. Ebates sends out payments earned of $5.00 or more, every three months. If your balance is below $5.00 it will carry over to the next period. You may opt to get a check in the mail or paid through Paypal. Ebates will pay you to refer new members to their site who shops and makes a purchase at one of their partner sites. Dosh is an app available on iPhone and Android that you link your credit or debit card to (safe and secure) and just shop like normal. If you shop at one of their partner stores you automatically get cash back in your account. You can cash out to Paypal after your total in your Dosh account hits $25. Dosh will also pay $5 per person that you refer and links their credit or debit card. That person will also get $5 in their account. *Through 11/21 (Noon CST) you will get $10 per referral. 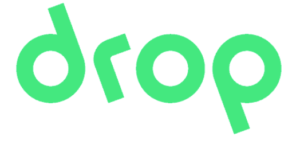 Drop is an app that once you link your card they will give you points every time you shop. They have lots of partner stores where you can easily rack up your points. When you are ready to redeem there are many different gift cards you can choose from. Amazon, Starbucks, Target, Applebees, IHOP, iTunes and more. The minimumn amount to redeem is $5. You can earn $5 just for signing up using my link (my code is elzue) and linking your card. Then you can earn $5 per person that you refer and link their card. Get paid to shop for groceries and more. Just go to your local grocery store, drugstore or mass retailer and shop like normal. After you shop, log into the Ibotta app on your phone or tablet and look to see if anything you bought is on their rebate list. If so, click on the item(s) and scan your receipt. Watch money be added to your Ibotta account within 24 hours (usually much less). Sign up to get a $10 welcome bonus by using my link and earn $5 when friends sign up with your referral code and redeem their first offer. Once you hit $20 you can cash out and have your money transferred to PayPal, Venmo or gift cards. 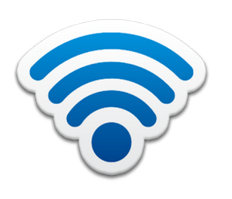 You can check out my full Ibotta post- Ibotta: The most popular cash back app. Checkout 51 is like a lot like Ibotta. You do your shopping, go through the app, add offers, upload your receipt and earn cash back. You can cash out once you hit $20 and Checkout 51 will mail you a check. Refer a friend and earn $5 in your account when they redeem their first product. Fetch Rewards is even easier then Ibotta and Checkout 51. After you shop you just simply scan your receipt and earn points. Once you hit 3,000 points you can cash out for gift cards. Fetch Rewards has tons of different reward choices. Amazon, Walmart, Target, Kohl’s, Barnes and Noble, Visa Virtual Gift Card, Lowe’s and the list goes on and on. Download Fetch Rewards on your iPhone or Android phone. Then use my code AE2QB and get 2,000 ($2.00) points for signing up. You can then earn 2,00 points for each referral once they submit their first receipt. Coinout is a simple app of just scanning your receipts. The difference with the other receipt apps verse CoinOut is that with CoinOut you can scan any receipt (minus ATM, lotto tickets, credit card slips, and money orders). The pay out is small but it does add up. You can cash out with no minimum to your bank account or an Amazon Gift Card. Although if you want a PayPal payment the minimum is $2.50. Simple is a checking account that is free with no fees. While you can use your Simple debit card like a regular checking account, Simple makes budgeting and saving money really….simple. When you sign up for an account through a link like mine, order your debit card, add some money on it, and make your first transaction (can be as little as $1.00), you will magically make $20. You can also refer others and when they earn their $20, you earn $20 as well. All right into your Simple checking account. Cash App is an app that you can use to instantly send and receive money from people. There are no fees to use it. You can have the money go to your checking account or you can get a Cash App debit card. When you sign up for Cash App using my code and make your first transaction you will get $5. Then you can refer your friends and when they made their first transaction, you both get $5. Mobile Performance Meter/Embee Pay is an app for Android smartphones only. You download the app and it runs in the background. Once a month you will get a survey about your phone and service. There are many different gift cards available when you cash out. Last I counted there were over 70 choices from Amazon, Red Robin, IHop, Visa Virtual Card, Best Buy, and so more. The lowest amount you can cash out at is $1.00. Very Dice is an app where you roll the dice and get points. You can start off with 30 free rolls by using my code 173930. After that you can get one spin a day for more rolls, watch sponsored videos, do other activities or buy more rolls. Very Dice is different when it comes to redeeming your points. You shop their store (Amazon) and purchase items with your points. They ship your item(s) to you for free. Level Rewards is a little bit different than the other ways I make money. It is basically an advertising platform where you get paid to refer people to different companies. Companies found that they aren’t really reaching people through commercials the way they use to. With Level Rewards, you invite people to try out free and paid trials for companies. They are called offers. Offers are worth different amount of credits. With credits, you climb the levels and are able to make more money when people you refer climb the levels. When I first was introduced to this type of making money I was worried it was a scam. In the past 6 years I have tried out 5 different companies just like this and Level Rewards is my favorite. It is legitimate and I have cashed out many times. Most likely you have heard of Uber, probably even Uber Eats. Uber is where you drive passengers around and Uber Eats is where you pick up and deliver food. Both are great ways to make money and make it fast. I use to do Uber Eats (then I moved to a city that doesn’t offer it). I choose Uber Eats over Uber because I was able to take my children with me (my oldest stayed in the car with my younger kids). Also, with Uber Eats I wasn’t taken as far away from my home area. The nice thing with Uber and Uber Eats is that you can cash out to your debit card instantly. Many times I would do one or two deliveries and cash out to get the kids some lunch and then off to do more deliveries, cash out after and hit the grocery store on the way home. Uber/Uber Eats has a referral program that changes often. Sign up with my link to find the current offer. My invite code is TRACIW127OUE. Swagbucks is a website but also has many apps for Android and iPhone. There are many ways to earn on Swagbucks. Searching, shopping, watching videos, doing trials, playing games, and more. You earn points and then you can cash out your points for gift cards, Visa card or PayPal. 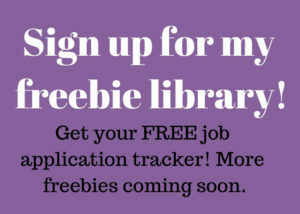 There are many more sites, apps and side hustles I can’t wait to share with you. I will be adding and organizing this page as I write more posts and I will also be writing more in-depth posts about each one. If you have a money making gig you want to tell me about, please leave me a comment or send me an email. I would love to hear from you. Lots of great ideas here – thank you. I love having this lost all together! I use a few of the already, but I’m anxious to try the others! Have fun, Amy. I love downloading and learning new apps. Especially those that make money lol. Wow! This is a great list! Some I have heard of but some are new to me! I’m definitely going to check them out! Thank you! Thank you so much for checking out my list Jaden. It’s amazing new ones keep coming out. I have a couple of these, but never knew there were that many others. My phone has zero memory for all these, I’m gong to see which ones I like the best and get them on my tablet. Thank you for the list. Thanks for checking out my list Rosie. There are so many, I have to split them between my phone and tablet as well. These are some solid ideas! Thanks for sharing them with everyone. Thanks so much for checking them out. These are great ideas. I love the cash back apps, especially Ibotta. Thanks for the info! Hi Victoria. Ibotta is my favorite as well. Thanks for visiting. I’m excited to try Dosh and Coinout. I had never heard of these two before, but anyway to pinch pennies is worth a try. Thanks! I am a penny pincher right there with you, Nicole. Some of these apps pay pennies at a time (CoinOut literally does) but it all adds up. What a great detailed list. I had never heard of a lot of these. You’re welcome. Thank you for visiting my site Futhi. Thank you, Peter. I appreciate your comment. I know some of these are amazing from experience. I am a huge fan of ebates, ibotta, and checkout51. I am certainly going to have to check out the rest! Thanks for sharing. I totally agree, Lisa. They are great programs that can be lucrative. Let me know how you like the other ones. Really awesome list! I am a member of quite a few of them but I also found some new ones to try out so thank you!